Arriving in the UK as a partner student from Hubei University, she was the first Chinese student on the BA (Hons) Theatre Practice: Creative Producing (now the BA (Hons) Drama and Performance) – and although it was a big step for her, she is delighted that she took it. "There were times I felt lonely at the start," says Daizi. "Getting to know the language and the differences in theatre techniques was a challenge, but my Course Director and classmates helped me a lot and my English improved really quickly." 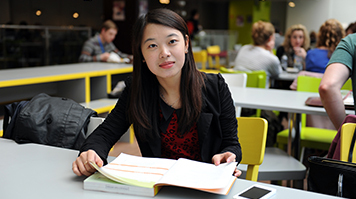 Away from her lectures and seminars, Daizi also benefited from the support LSBU is able to offer to international students through a number of ways. "The international office explained everything I didn't understand in the UK, and the Student Centre was great too. They helped me with my personal statement and CV, but I know other people who have turned to them with all sorts of problems – from accommodation and money to finding an internship or a part-time job – and even relationship problems." Daizi also credits the Chinese Students and Scholars Association with helping her to settle in, and has been an active member throughout her time in the UK. "I was even president for the LSBU branch in my second year," she says. "It's been great, organising Chinese activities, including a Chinese New Year Gala – and because it's a national organisation, I've made friends from other universities too. I don't just have Chinese friends though! One of my best friends is from Brighton, on the south coast of England, and I visit him often. I've travelled a lot in the UK and have been to Scotland and the Lake District. For New Year, a group of us went to Liverpool to watch the football because one friend is a big fan." Once Daizi had overcome the initial challenges presented by moving to a new country, she found that she loves the British way of learning. "In China, students study for four years and might have classes in ten modules every day. In the UK, my Honours degree was three years long with six modules every academic year, which has really enabled me to focus on my interests." The teaching style she encountered at LSBU also resonated with Daizi, who found UK lectures and seminars much more suited to her. "The teacher doesn't just stand at the front and speak to the students," she says. We have to think for ourselves and come up with our own ideas and discuss them in class. The tutors guide us to improve our projects, but we as students make the final decisions. It's really improved my confidence and my personal skills. Daizi enjoyed her undergraduate degree at LSBU so much that she subsequently enrolled on our MA Journalism to help pursue her dream career. "I've managed to get an internship at Xinhua News Agency in China," she says. "I know that wherever I choose to work as a journalist, I'd like to promote culture and lifestyle – both the cultures of the UK and of China." Daizi is glad that she made the decision to study at LSBU, and her family agree that it has benefitted her. "They think that studying here has been a very good choice because I'll be more mature, more confident and more independent – and for me, I'm glad I did it because I really love the UK!"